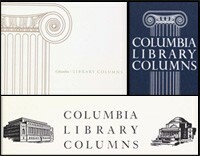 Columbia Library Columns was published from 1951 to 1996. It was edited by Roland Baughman, Head of Columbia's Dept. of Special Collections, until his death in 1967; then by Kenneth A. Lohf, until his retirement in 1992; then, briefly, by Jean Ashton and Michael Stoller. Its final issue was Autumn 1996. The digitized collection comprises some 6,900 pages in 46 volumes (135 issues). Over the years contributors included faculty, University adminstrators, writers, historians and collectors, as well as Columbia librarians. Articles focused on individual collections, special acquisitions, literary topics and issues relating to the growth of Columbia's libraries and special collections generally. Keyword searching is not currently available for this title. Locascio, Aline. "Columbia's Library for the Twenty-First Century: The Renovation of Butler," (45:2 Autumn 1996)—In the final issue of the journal.